A flagbearer hopeful of the Convention People’s Party (CPP), Samia Nkrumah, has downplayed the effect of the defection of Dr. Abu Sakara, saying it will not affect their prospects of winning the Ghanaian people over. The 2012 flagbearer of the CPP is no longer a member of the Nkrumahist party and will be contesting the 2016 presidential elections as an independent candidate. In a statement, he explained he wanted to “provide a more focused national interest”. “I wish to announce to my fellow compatriots that I will contest as an independent Presidential Candidate in the 2016 general election. “The purpose will be to provide a more focused national interest platform on which we can truly build national consensus around the key issues that will really transform our nation for the good of all of us,” the agronomist stated. But the daughter of the Party’s founder, Osagyefo Dr. Kwame Nkrumah, said Sakara’s move is feeding into a bigger plan by their detractors to disarm them as a political force. “These are all just machinations to plant the idea of fear and terror in the CPP,” Samia told Kafui Dey and Baisiwa Dowuna Hammond on the Gh Today morning show on Gh One TV Tuesday. She said they did not see the defection coming because “there were no problems we could ascribe to his actions”. A former flagbearer of the CPP, Dr. Papa Kwesi Nduom, whom Sakara succeeded, also defected to form his party just before the 2012 elections. Samia, who is now gearing up to run as the 2016 flagbearer, said it was too soon to establish a trend of uneasiness in the party. “Sooner or later, a catalyst will come and things will overturn. “I am very courageous because I am armed with a vision. And we as a party are committed to reviving the seven-year development plan that was shelved for so many years. “People said Kwame Nkrumah’s ideas were far ahead of his time, well, now it’s about that time we pull them through 50 years on”. 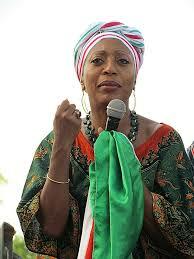 Samia is positive this election year is a “spiritual year” for the CPP. “We the followers of Nkrumah are going to liberate ourselves and take up our role as the nation’s leaders”.